Continuing our futures discussion, it seems that South African winery Cloof is offering its Bordeaux blend wine to consumers en primeur in the UK. The newly renamed ‘Lynchpin’ right bank blend would be the first commercial offering a South African future. Publicity stunts aside, it seems to this winemonkey that the whole point of purchasing futures from the consumer’s stand point is to obtain an allocation of wine at a more reasonable price than when the wine will be released. As much as South African wines have come around (don’t get me started on pinotage I still can not go there), I can’t imagine that the wine, which is being offered at about $15, will generate any economies of scale for the consumer versus waiting for the bottle to be released. The wine which is actually being sold as a pre-release (a technique used by many US wineries) is available only from UK retailer Magnum Fine Wines. On top of that, (US distributors take note here) there doesn’t seem to be any distribution into the US. 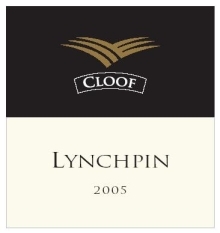 Don’t get me wrong I am pulling for all wineries to do a bang up job making and selling their product, but I can’t believe there is going to be a run on Cloof Lynchpin. That being said, apparently an unnamed A-list wine writer from the UK has jumped on this bandwagon and ordered up 30 cases of the ZA juice. But for me, I can wait. The winery changed ownership in 2002 and is making strides in improving quality. The winery sits on about 1,300 hectares with a bout 100 hectares under vine surrounded by wheat fields. The vines, which are untrellised and dry farmed, bake in the sun and the wines have been described as undoubtedly New World in style. Location: Darling, on the eastern slopes and flats of Dassenberg, 70km north of Cape Town on granite and oakleaf. Yield: Approximately 2.2 tons per hectare for Cab Franc, 6 for Cab, a mere half a ton for the Merlot. The wine, which is culled from prime blocks on the property, is aged in 75% new French oak for 14 months. I haven’t had the wine but the numbers and its locale suggest it will be reminiscent of big Aussie stuff with high ph (thus low acid) and over 15% alcohol. It is interesting to note that this wine is blended at the end of the alcoholic fermentation instead of barrel selected after some maturation time.